India’s retail and wholesale price inflation fell to multi-month lows in December amid signs of weakening economic recovery, creating wiggle room for the Reserve Bank of India rate setting committee to cut policy rates at its next meeting on February 7. Consumer price index based inflation at an 18-month low of 2.19% in December against 2.33% a month ago, as food prices continued to slide. 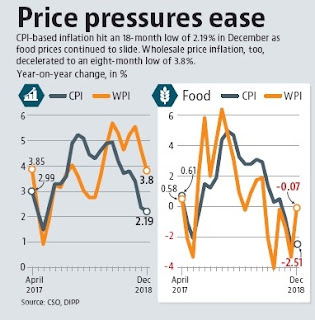 The wholesale price index data released earlier in the day by the department of industrial policy and promotion showed that wholesale price inflation decelerated to an eight-month low of 3.8% from 4.64% the previous month, on the back of softening inflation for fuel as well as manufactured items. With crude oil prices falling 40% in past three months, higher oil production in the US and weakening oil demand, analysts do not expect oil prices to rise further. While the Indian crude basket declined to $57.8 billion per barrel in December from $65 billion per barrel a month ago, the rupee appreciated to 70.72 per dollar in December from 71.79 per dollar in the previous month, slowing fuel inflation. Slower-than-expected economic growth projection and a benign inflation scenario may force RBI under its new governor Shaktikanta Das to change its stance and cut rates to support growth. India’s factory output growth crashed to its lowest in 17 months at 0.5% in November, the outcome of an unfavourable base effect as well as contraction in manufacturin. The CSO’s full year growth estimate suggests that in the second half (October-March) of 2018-19, the economy may slow down to grow at 6.75% compared to 7.65% in the first half (April-September). Finance minister Arun Jaitley will present his interim Budget on February 1. The government has already exhausted 112% of the full-year fiscal deficit target in the first eight months (April-November) of the fiscal year. Subdued collections in goods and services tax and slow progress in its disinvestment programme have put pressure on the government’s fiscal math for the current year. RBI governor Shaktikanta Das, who took charge last month, said at his first press conference that inflation remained within RBI’s target and its outlook was benign. Principal economic adviser in the finance ministry Sanjeev Sanyal in an interview last month said RBI needs to structurally reduce interest rates as the government has anchored inflation to a lower level.